When the volunteers of the Amador County Animal Response Team looked up from their training exercise the evening of September 9 last year and saw billows of smoke rising over the ridge behind the American Legion Ambulance headquarters, they knew immediately this was not going to be a routine training meeting. They were witnessing the initial blowup of the Butte Fire. Before the evening was over, two volunteers, Kathy Vicini and Carol Scarrone, had the ACART supply trailer positioned at the County Fairgrounds and were completing setup just as the first evacuated animals rolled in. 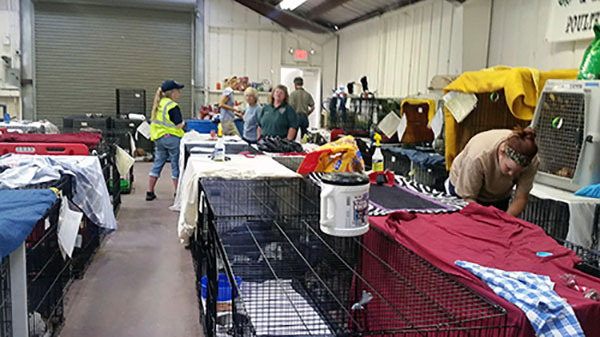 Before the event was over, 13 days later, they and many other volunteers had put in over 2,000 hours providing shelter and care for more than 450 displaced pets, horses and livestock. 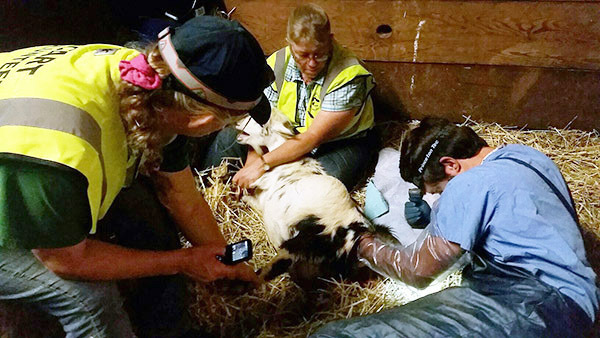 At the end, in spite of the initial disorder that accompanies disaster, all but one of the animals were returned safe and sound to their owners. There were even three baby goats born while at the fairgrounds shelter. ACART, an all-volunteer nonprofit organization, has been in existence since 2009 and was formed by a group of Amador County residents who saw a need to provide care for pets and other animals displaced by fires and other emergency events. Red Cross shelters admit only service animals, so families are often hesitant to evacuate if it means leaving their non-human members in harm’s way. ACART works under the supervision of Kelly Reason, Director of Amador County Animal Control. All ACART’s members are certified Disaster Service Workers and must undergo a background check before being admitted into service. Continual training in all aspects of animal care is an important part of the ACART experience. ACART receives no government funding, relying solely on contributions and the proceeds of fund raisers such as its upcoming Pig Roast and Raffle, to be held October 15 at the American Legion Hall. Tickets to the event are limited to the seating capacity of the hall, so advance purchase is a necessity. Admissions can be purchased from ACART members, at the Amador County Animal Control shelter, or online at www.amadoranimalresponse.org. Individuals interested in learning more about ACART or helping in its work are urged to visit the website, attend one of our monthly trainings, or email questions to info@amadoranimalresponse.org.